With the exception of the Clumber Spaniel, I am the oldest of the British Spaniel Breeds. I got the name Springer Spaniel because my ancestors were used by hunters to "spring" game from cover. My coat is straight, medium long and weather resistant. I need a little help brushing it and keeping it clean and sometimes I need help getting the mud loose from my paws. I really enjoy exercise, so I like to live where I have room to run, play, and maybe even hunt a little. I am very intelligent and besides being a super gundog, I make a good family pet. Maybe you remember seeing me on television quite a bit when the Bush family took me to live in the White House with them. When fully grown, I am between 19 and 20 inches tall (48.3 to 50.8 centimeters) and I weigh between 49 and 55 pounds (22.1 to 24.8 kilograms). We have no English Springer Spaniel Breeders listed at this time. 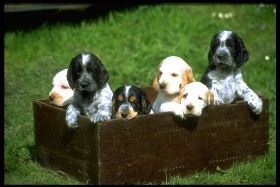 Click here to place your English Springer Spaniel Ad!